Today I'm going to share one of the easiest yet delicious Korean recipe which can be made with a handful of ingredients and that too in a quick time. It's a perfect serving for breakfast or tea time. One needs a bit of practice to make perfect egg rolls as they tend to break or burn if not done correctly. It's all about the timing and your rolling skills. Seaweed is easily available nowadays in superstores in dried and semi-dried form. The former variant is what we need for this recipe. You can serve it with regular tomato ketchup or with your favorite sauce. These egg rolls should be prepared fresh as they may get soggy if kept for a long time. Let's quickly make these delicious egg rolls for hungry taste buds. 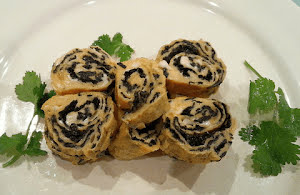 Relish these light, delicious and easy-to-make Korean egg rolls which are stuffed with seaweed sheets which give it a unique flavor and an irresistible aroma. If you're using a seasoned seaweed sheet which has a light salty flavor, make sure you moderate the amount of garlic salt mixed in the whipped eggs. Cut the seaweed sheet into smaller squares to cover the omelette entirely. Take a mixing bowl and break all the eggs in it. Add rice wine and garlic salt in it. Whip for about 2 minutes. Brush sesame oil on the base and switch the flame to low. Pour seasoned and whipped eggs in the pan and spread it evenly by tilting the pan to make a thin layer of the omelette. After a minute or two carefully arrange all the seaweed sheet squares on the omelette such that no empty space is left. After 6 minutes, roll the omelette with a wooden spatula from one side and transfer to a plate. Let it cool down for about 4 to 5 minutes. Cut the egg roll into 2" thick pieces with a sharp knife. Arrange vertically in a serving plate and garnish with coriander sprigs.